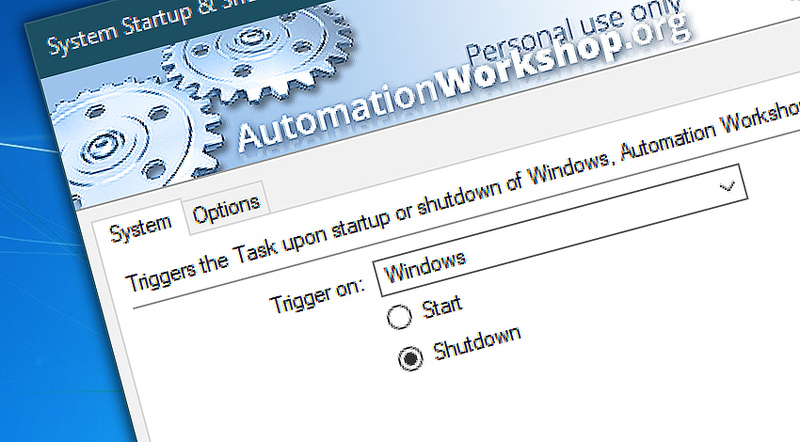 Run Tasks when Windows starts or commences shutdown with free System Startup / Shutdown Trigger that is a part of Automation Workshop Free Edition, a Windows automation software. You can also trigger the Task when Automation Workshop Service is started or stopped, or when Automation Workshop Manager (graphical user interface) is opened. Often, some operations have to be performed when the system is started. Or, perhaps, some quick script needs to be run while the system goes into shutdown. System Startup / Shutdown Trigger can easily perform such Tasks and many more. 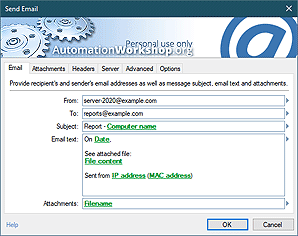 Automated Tasks can run whenever Automation Workshop's Service is started or stopped, and even when user accesses its graphical interface. When a Task is started by System Startup / Shutdown, it can perform a series of operations ranging from file operations (e.g., automatic file copying, moving, deleting as well as creating or extracting archives), email operations (send emails automatically) to registry actions (e.g. create, modify or delete registry entries), opening and printing documents, etc. Freeware System startup / shutdown trigger detects startup or shutdown of Windows and Automation Workshop Manager or Service to initiate a predefined automated Task when that happens. System Startup / Shutdown can run a Task, execute applications and run scripts on Windows startup or during initial phases of shutdown procedure. Automatic processes can be started whenever Automation Workshop Service is started or stopped. An automated Task can run whenever user accesses Automation Workshop Manager, the software's graphical user interface, or closes it. Detailed overview of free System startup / shutdown trigger including the description of minute details is available on the website of commercial version of Automation Workshop. Overview · free System startup / shutdown trigger features and usage summary. System · specify to detect Windows or Automation Workshop startup or shutdown. Options · set triggering delay and enable or disable the System startup / shutdown trigger.